"During sandstone quarrying operations in the late 1870's on the grounds of Nevada State Prison, in Carson City, a variety of animal tracks were found, including those of mammoth, bison, horse, deer, wolf, birds, as well as some large oblong tracks of uncertain origin. In 1882, sheriff W. J. Hanks of Storey County brought the find to the attention of H. W. Harkness of the California Academy of Sciences in San Francisco. Harkness identified the track beds as late Pliocene in age (approx. 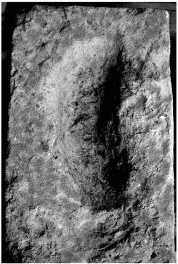 2 million years old) and interpreted the problematic tracks as giant human footprints (Davis, 1912)."